With the holiday season in full swing, you may be planning a family get-together. Besides the eating and visiting, have you thought of creating a fun family history experience for all ages? 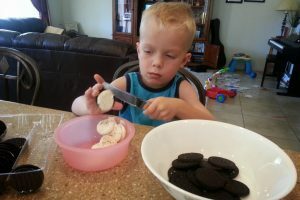 Today I’m sharing a fabulous activity created by Lynnette, one of our FamilyLocket subscribers. Although Lynnette did this activity for Thanksgiving, the ideas could be adapted for any season or family gathering. Lynnette has three married daughters and twelve grandchildren age 2-17 and all were coming for the Thanksgiving holiday. She wanted to do activities to help her family get to know their Mayflower relative, John Howland. She also wanted to involve her son-in-laws and capture the attention of the children as well as the teens. Three elements made this activity successful. How often do we get an idea, but its at the last minute and too late to actually put into play? Lynnette had discovered a great children’s book about their Mayflower ancestor: The Boy Who Fell Off the Mayflower, or John Howland’s Good Fortune, by P.J. Lynch. Who doesn’t love a great picture book and Lynnette figured that the dramatic story of John Howland falling overboard then climbing up a rope to save his life would appeal to her grandchildren. She sent a copy of the book to each family ahead of time and prepared pedigree charts to put in the cover of the book to show the relationship from the grandchildren to John Howland and other Mayflower ancestors. Lynnette also sent an email early in November to family members inviting them to do a Mayflower Ancestor Scavenger Hunt on Relative Finder. The email gave information about how to use this great website to discover their Mayflower ancestors. 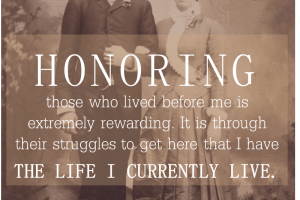 Nicole and I love to use Relative Finder to capture the attention of non-genealogists in the family and have shared our ideas here on Family Locket: Are You Related to the Pilgrims? and Are You Related to a Signer of the Declaration of Independence? You can find out if you’re related to many different groups from broad (Famous Americans) to narrow (Salem Witch Trials). 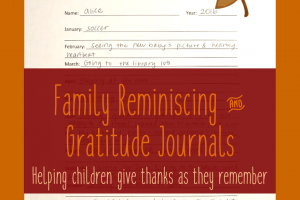 With the families having read the book and tried out Relative Finder prior to the holiday, Lynnette created two activities for the Thanksgiving Gathering. Lynnette wanted the children to hear and see the names of their Pilgrim ancestors so she created bingo cards, then a fun variation on the usual game. One step that we may not think to do is evaluate the activity afterwards – what worked and what didn’t. Sometimes our best ideas don’t quite go over as we had envisioned, so instead of giving up, take the time to record some thoughts about how to make an activity more effective the next time. Thanks, Lynnette, for these great ideas. This holiday season, take some time to think how you could share some family history with your loved ones! What wonderful fun! ps–I’m quite sure you spell her name with two n’s. Lynnette, for the record. These are all such fun and great ideas! Thanks, I’ll get her name corrected! Good catch.